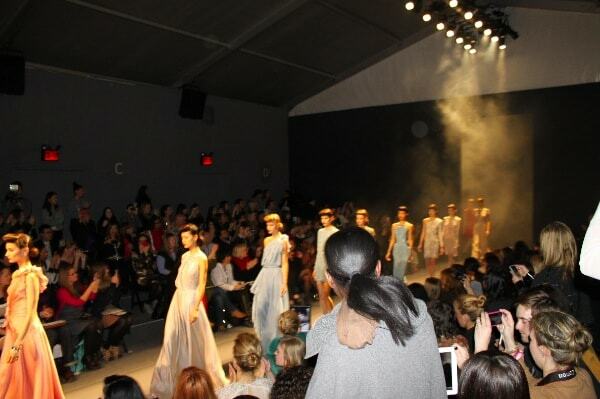 Jenny Packham was the first collection that I attended this Fashion Week and what a way to kick it off! 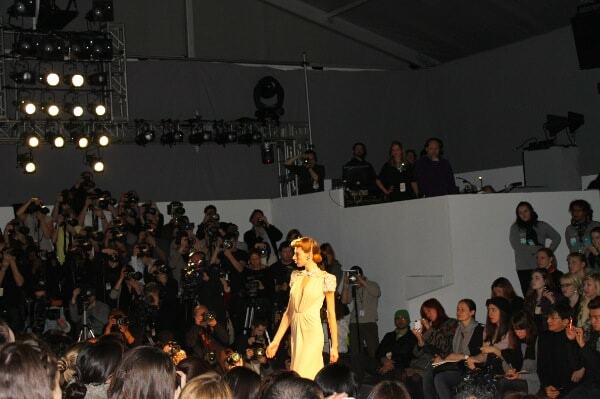 Jenny Packham’s Fall/Winter 2012 collection was inspired by 1940’s Film Noir, and it dazzled from the moment the lights went down until the last model left the stage. The show began with fog emanating from backstage in front of red backdrop as burlesque music played. All of the sudden from the fog appears the first model in a drop dead gorgeous fitted red slinky gown. The effect was so dramatic that you could literally hear the audience gasp, and the show only continued to dazzle from there. The Jenny Packham collection was comprised of evening gowns that smoldered and demanded to be noticed. The collection featured lots of gowns in black, red and champagne with glittering details that made each look like a walking piece of art. In keeping with the 1940’s film noir inspiration, the gowns featured silhouettes with wide shoulders and cinched waists. The models were all styled with retro 1940’s hairstyles and large art deco inspired earrings that enhanced the overall Film Noir vibe of the collection. This collection was a departure for Jenny Packham, usually known for her sweeter, lighter flowing chiffon gowns. However, the new direction taken with this collection is stunning and I believe these are some of her best gowns yet. Previous award seasons have seen Jenny Packham gowns on some of Hollywood’s most fashionable actresses like Angelina Jolie, Kate Winslet, Emily Blunt and Reese Witherspoon and bespoke gowns made for the Duchess of Cambridge, and I predict that we will be seeing many of these gowns in the upcoming award season on actresses looking to evoke old Hollywood glamour. To see more fabulous Jenny Packham creations visit www.jennypackham.com.